Introducing the Putting Challenge 2019 ! 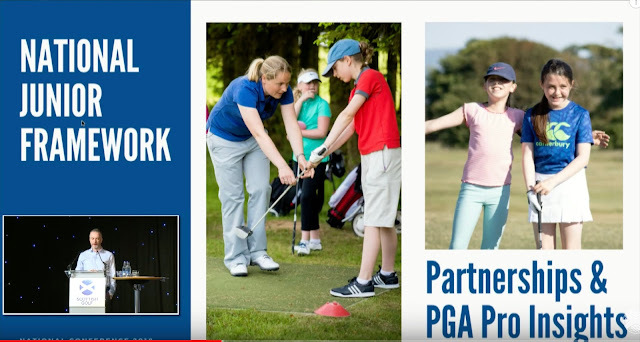 Karyn Burns is introducing a 30 day on line putting course to help you improve in 2019 — Why not check this out. Many congratulations to Renfrewshire’s Bill Mitchell on being awarded a BEM for services to The Golf Handicapping and Course Rating Systems in the UK and Abroad. Bill is husband of Maureen (pictured left) who is the West of Scotland Greenlees Secretary. A massive thanks has to go to Scottish Golf, without them I wouldn’t be where I am. It has been the greatest honour and privilege to have represented Scotland around the world. 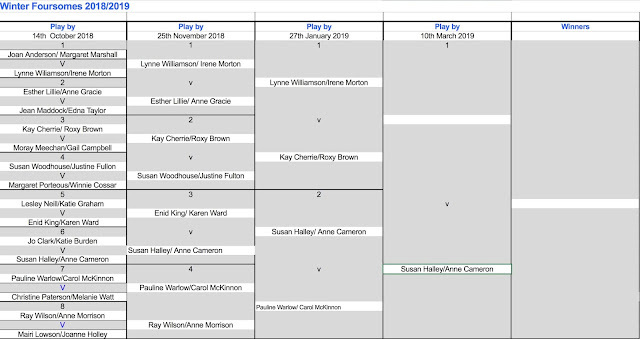 Hannah Darling, (Broomieknowe), Chloe Goadby ( St Regulus) , Connie Jaffrey (Troon Ladies) and Hannah McCook (Granton and Spey) join Shannon McWilliam (Aboyne) in making up a contingent of five players from Scotland included in the group. Lanarkshire's past County Champion Rachael Taylor is the leading Scot who is tied in 14th place with past Curtis Cup player Bronte Law on 3 under par. Vikki Laing is tied for 25thspot on one-under-par. 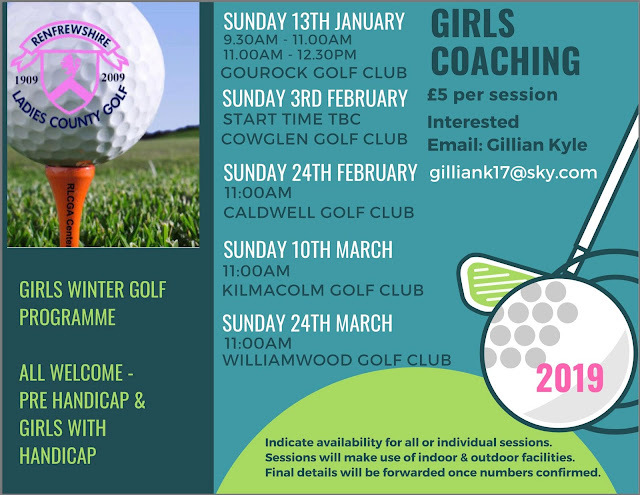 Gillian Kyle along with Clair Barclay, Liz Hale, Gill McLeod and Lynda Bradley are trying to give girls in Renfrewshire with and without a handicap some sessions to attend over the winter. Currently there are 12 girls going to Clare-Marie Macauley at Paisley Golf Club for 4 formal sessions but they have organised another 5 sessions to include ALL girls. CLICK HERE TO GET THE POSTER and email Gillian Kyle if you are interested. mygolfranking.net AYRSHIRE LADIES GOLFER ofWeek 18/49 is KATH MACKELLOR (West Kilbride Ladies) who enters the Top 20 of Ayrshire Ladies MGRanking at No 11. 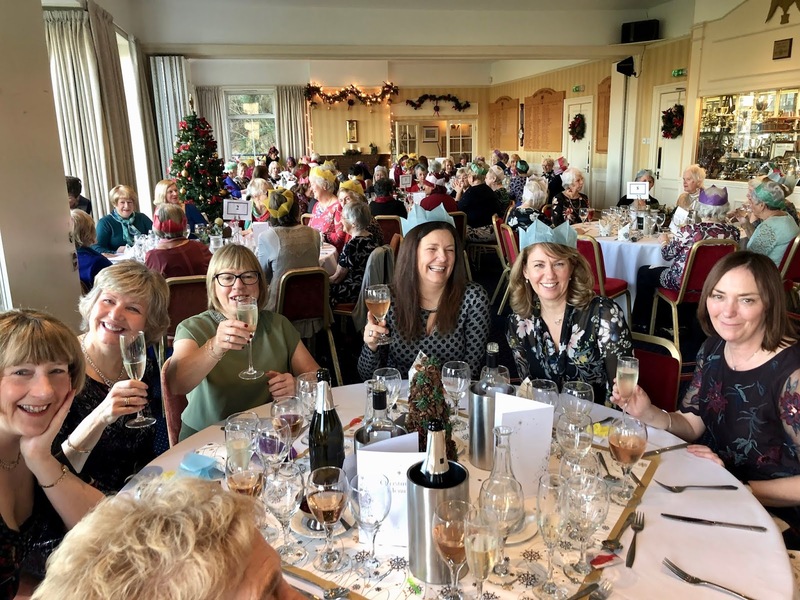 The County Finals were held at Kilmacolm Golf Club this year where the ladies were magnificent and couldn’t do enough for us all – they had indeed been superbly organised. 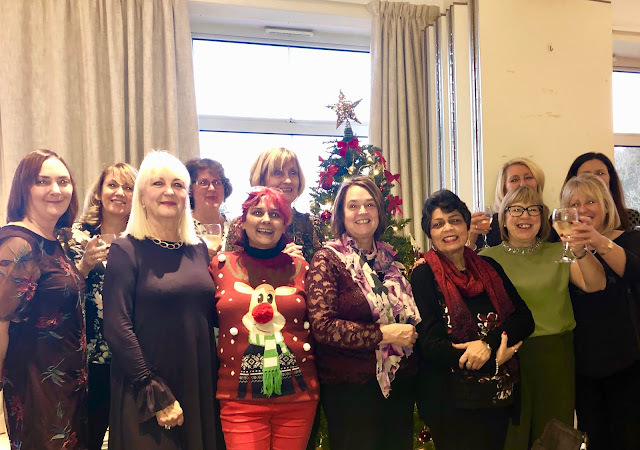 Now it is December and there was certainly a fantastic, festive turnout for their Christmas Cracker competition, followed by mince pies and mulled wine in the clubhouse - plus a terrific organised photograph of them taken at the end of the day !! SPONSORED SPEED GOLF BY PERTH AND KINROSS COUNTY - 18 HOLES IN 35 MINUTES AND 26 SECONDS !! It proved to be 3rd time lucky for Perth and Kinross County Sponsored Speed Golf event at Strathmore Golf Club on Sunday. Katy Alexander, Megan Ashley, Laura Campbell, Jenny Collins, Jen Saxton, Isla Moncrieff, Laura Walker & Caroline Henderson. With Isla's plan in hand, they raced round the 18 holes in an astonishing 35 mins & 26 seconds. And, they almost broke 90! Well done everyone. It was a fantastic team performance! Margaret Whelan, Sal Shepherd, Ali Mackie and Karen Ballantyne. On Saturday 8th December the charity SocialBite’s ‘Sleep in the Park’ fundraising event took place to raise money for and awareness of homelessness in Scotland. 10,000 people across four cities in Scotland chose to sleep out overnight, and in Edinburgh this took place in Princes Street Gardens. The SocialBite Charity aims to help those who have no choice but to sleep out in all weathers. Three lady golfers from Dunbar Golf Club, current Ladies Champion Margaret Whelan, past champions Karen Ballantyne (Scottish Vets Vice Captain) and Sal Shepherd together with Craigmillar Park Golf Club’s Ali Mackie took part in the event. The ladies were under no illusion their experience would be a true representation of what it is like to sleep rough every night butit certainly was a tough night. The event heightened the ladies awareness of what an ordeal it must be to have to take to the streets each night, especially at this time of year. The ladies are so grateful to all those who have supported them. To date they have raised around £8,000 and stand 8th in the league of Top Individual and Teams Fundraisers. The fundraising has not stopped and the ladies are grateful to Dunbar Golf Club who have donated 2 four ball vouchers (for play Monday to Wednesday) to auction. Closing date for bids is Saturday 22nd December. The Dunmuir Hotel have also offered a 10% discount to anyone who would like to stay there before or after their game. Also donations can still be made to https://uk.virginmoneygiving.com/Team/KBsAllStars until 24 December. How disappointing to hear that the Council of National Golf Unions is not permitting one of the key changes in the New Rules of Golf coming into effect on 1 January in counting competitions. The whole point of introducing a Local Rule to stop a player having to return to the tee after either losing a ball or discovering it has gone out of bounds was to help speed up play. There is probably not a golf club in Scotland where the pace of play in a medal isn’t adversely affected by people having to trudge dejectedly back to a tee. website and, consequently, is being relayed at various rules seminars taking place in preparation for 1 January, that the new Local Rule is not being encouraged in club competitions. No, the “stroke-and-distance relief” is only “appropriate for general play where golfers are playing casual rounds or playing their own competitions”. What utter nonsense. Yes, of course, this isn’t a rule that should ever be implemented in professional or elite level amateur competitions. However, the sooner CONGU gets its head out of the sand over this one the better. Attempts to speed up the game simply have to be embraced. 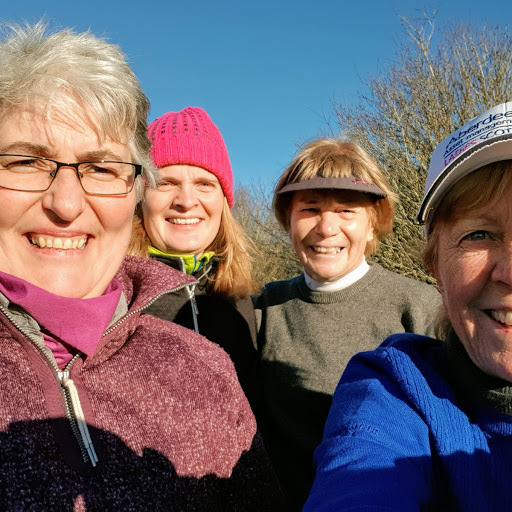 Scottish Golf is holding a ThisGirlGolfs-on-tour event which takes place at Broadlees Golf Club South Lanarkshire in January 2019. Other Scots to come through the final eliminator at Amelkis Golf Club, also in Morocco, were amateur Alison Muirhead (280) who was the top Scot, Rachael Taylor (283) and Heather Stirling (285). McCook, Muirhead, Stirling and Taylor should figure among the leading 38 and ties who will advance from the current pre-qualifying eliminator at Amelkis Golf Club after Monday's final round. Muirhead is joint ninth on 210; Taylor T15 on 212; Stirling T21 on 215 while McCook shot one of the third day's best rounds - a six-under-par, seven-birdie 66 - for joint 30th place on 216. Sweden's Linnea Storm leads the field by seven shots from Ireland's Leona Maguire after a brilliant six-under 62 for a 54-hole tally of 197. 05 N Dreher (Aut) 66 68 71. 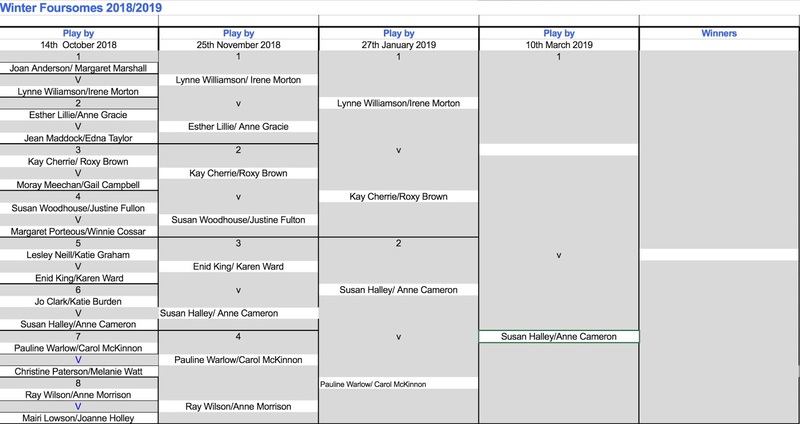 In the Lanarkshire County Winter foursomes 1st Semi Final Strathaven Golf Club pairing of Susan Halley and Anne Cameron beat Pauline Warlow and Carol McKinnon (Cathkin Braes) by 1 hole to reach the final. Scottish Golf are delighted to announce a tremendous response to the launch of their new digital solution with over 100 golf clubs registering an interest within 48 hours. In addition, golf clubs will receive a fully customisable and easy-to-configure website which includes complimentary hosting. The announcement came at Edinburgh’s International Conference Centre on Saturday 1 December where 450 delegates attended their National Conference, with thousands more tuning in online. For those of you who didn't manage to attend, they hope you enjoy this video recap of the day, starting with their CEO Andrew McKinlay who opened proceedings by outlining their vision for the future. The R&A SwingZone, which offers thousands of young people the opportunity to come and try golf for free in the Spectator Village during The Open each year, will also continue to be supported by the Golf Foundation. 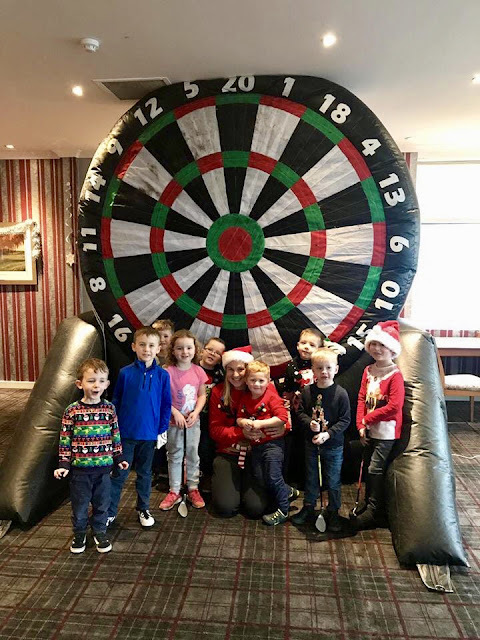 Past Renfrewshire County Player Clare-Marie Macauley who recently held a coaching session for the Renfrewshire County Girls held a Festive Academy Competition yesterday at Paisley Golf Club. The weather didn’t dampen the spirits of the 30 boys and girls who can be seen to be enjoying the indoor challenges and having lots of fun. Clare-Marie is the assistant professional who runs a superb junior coaching program at Paisley Golf Club where her brother Andy Carlton is the professional. Paul Lawrie has described Scottish Golf’s trail-blazing new app as “phenomenal” and believes it can help turn the golf centre he owns on the outskirts of Aberdeen into a profit-making facility. The 1999 Open champion delivered his glowing endorsement for the digital platform, which is being offered free to golf clubs around the country at a time when just 21 per cent of the total golfing population in the sport’s birthplace is made up of club members, as he attended the second Scottish Golf national conference in Edinburgh. Lawrie, who is actively involved in running his golf centre on the south side of the River Dee along with his wife Marian, also gave a thumbs-up to the governing body encouraging clubs to allow so-called nomadic golfers to gain handicaps by playing in open competitions. 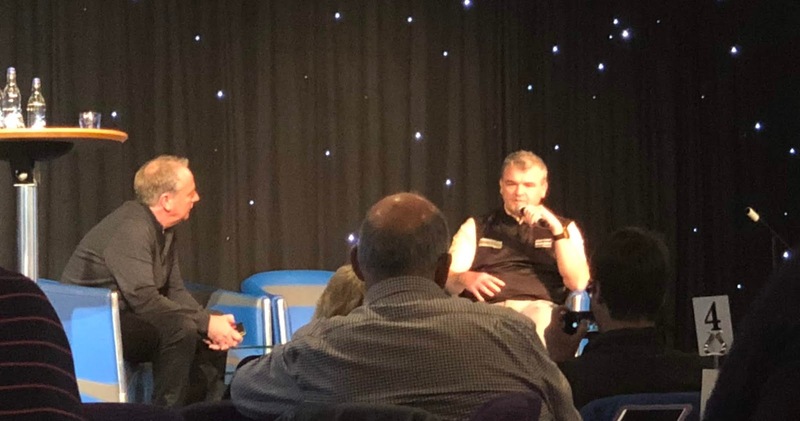 “It is hugely challenging, no matter who you are,” said Lawrie during a chat on stage with Iain Forsyth, Scottish Golf’s commercial director, in front of 450 fellow delegates, when asked about his facility. “The golf industry has not gone through the best of times and hasn’t done for a long, long time. Our facility currently runs at a slight loss every year and has done for a wee while, but we are trying to change that. 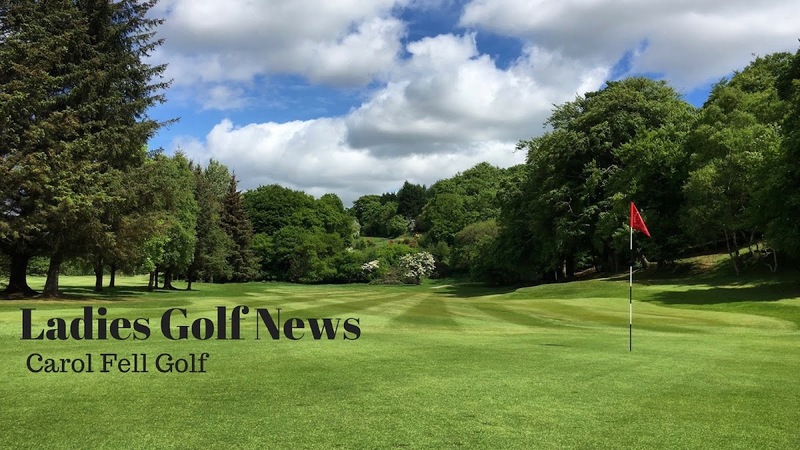 “We’ve got a lot of talented people who work very hard for us and we have recently become a Scottish Golf-affiliated club so people can get a handicap with us now. We’ve put in a couple of new tees to give us two par-4s and seven par-3s. You can play a medal now and that has helped us a little bit, but, having said that, we only gained 28 or 29 new members through that, so it is still a little bit of a struggle. Lawrie was speaking before the new app, which has been developed by leading tech company OCS for Scottish Golf to allow clubs to fully exploit income from pay-and-play golfers, was rolled out to delegates, the majority of whom were golf club administrators and committee members. A more positive event than the inaugural one 12 months ago, when the focus was on the fact that 5,000 club members in Scotland had been lost each year for a decade, this conference started with chair Eleanor Cannon saying she felt confident Scottish Golf’s stakeholders had now “united” after a “turbulent time over ten years”. In his address, chief executive Andrew McKinlay said that the governing body had a “firm financial footing” thanks to its stakeholders agreeing to an increase in the affiliation fee earlier in the year while Ross Duncan, the development director, updated delegates on a staff re-shuffle – seven regional development managers will be backed up by six central support managers – that is aimed at helping clubs in the ongoing fight with declining memberships. “Everyone has to be at the heart of change. Live it and breathe it!” he said. One of the main changes being sought is getting more women into the game at a time when females make up only 13 per cent of the total membership in Scotland. 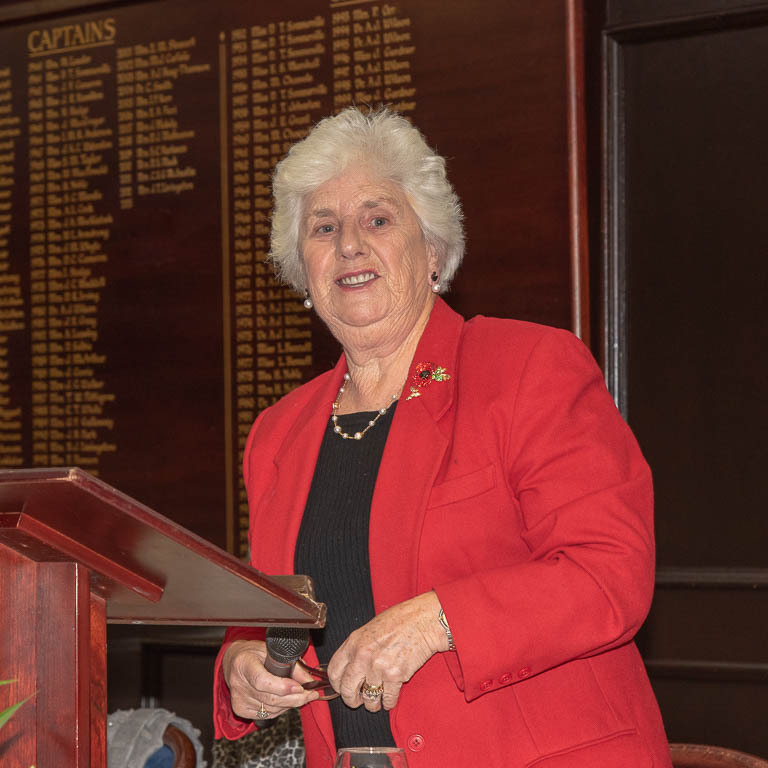 The governing body is also keen to change a culture that currently sees 83.5 per cent of clubs holding their main competitions on a Saturday reserved for men.